Setting up a LDAP Server on Rackspace Cloud Server can be quite painful. Here is a step by step guide to install LDAP on single server. As can be understood, at the time of writing this guide; we are using Ubuntu 14.04 PVHVM version like we did for Installing WordPress on Rackspace Cloud Server. You can read about Lightweight Directory Access Protocol (LDAP), if need to know the theoretical part. Why We Need to Create LDAP Server on Ubuntu? There is not even a single Software as a Service which can rightly solve all the needs for LDAP for all cases. Possibly the reader can recall Active Directory in a Windows environment, it is a database based system that provides authentication, directory, policy, and other services. LDAP (Lightweight Directory Access Protocol) is an application protocol for querying and modifying items in directory service providers like Active Directory, which supports a form of LDAP. Active Directory is a directory services database, and LDAP is one of the protocols you can use to talk to it. LDAP is a standard, Active Directory is Microsoft’s (proprietary) implementation. LDAP sits on top of the TCP/IP stack and controls internet directory access. It is environment agnostic. There are lots of systems that support LDAP to talk to them, not just Active Directory. 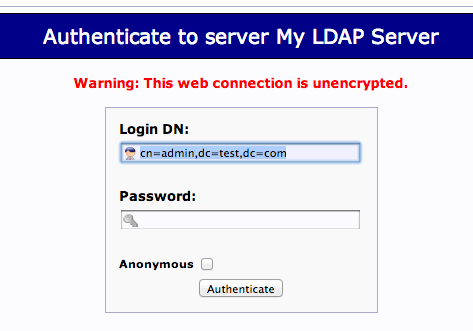 # if your DNS domain name entry was "ldap.example.com"
# LDAP would need to see "dc=ldap,dc=example,dc=com". You will receive a web login prompt with correct Login DN (distinguished name) pre-populated. This guide is on Installing LDAP Server on Ubuntu on Rackspace Cloud Server, we will not discuss the usage here. This Article Has Been Shared 3160 Times! Cite this article as: Abhishek Ghosh, "Create LDAP Server on Ubuntu on Rackspace Cloud Server," in The Customize Windows, June 10, 2014, April 21, 2019, https://thecustomizewindows.com/2014/06/create-ldap-server-ubuntu-rackspace-cloud-server/.